Today, our Free Friday becomes a little more carefree with our latest free STEAM lesson plan! This K-2 lesson is designed to get students up and moving, identifying and manipulating shapes, and designing their problem-solving skills. Plus, you get to play with bubbles – who doesn’t smile from the sheer joy of making bubbles? 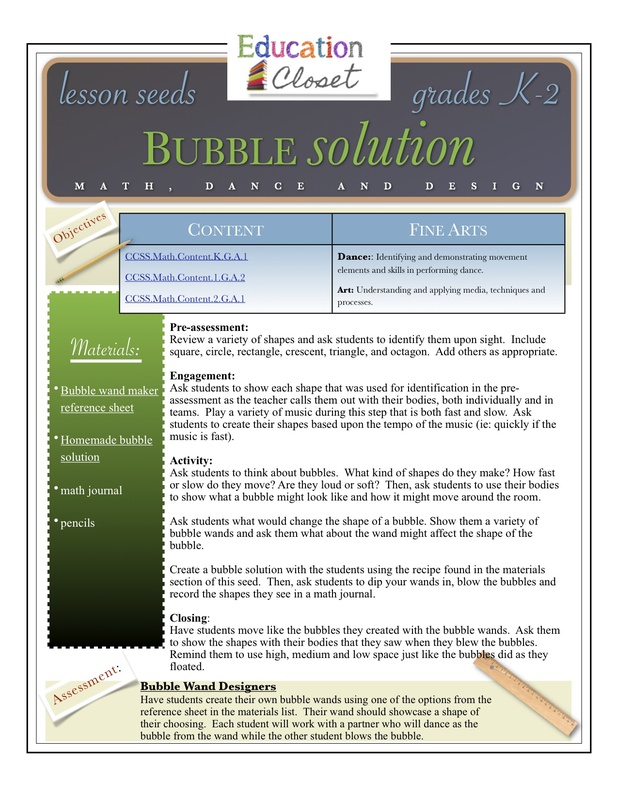 This lesson connects Common Core math (geometry) standards with dance and visual art standards to help make shape identification and transfiguration more concrete for students. Students get to dance as bubbles before mixing their own bubble solution and then moving in pairs based upon the shapes they create with a variety of bubble wands. As part of their assessment, students get the opportunity to design their own bubble wand to produce whatever shape they choose and then move as the bubble is being blown in a mirror to the shape that was created. This lesson can be done inside, but is truly much more fun if you take the learning outside when the weather is nice. This is a great lesson for the beginning of the year and will be one that students remember for years afterwards. Happy Friday, everyone!